Have you ever woke up with sore jaw pain, earaches, and headaches? If you have, you should not ignore the condition, because you may have a sleep disorder condition called bruxism. It is an unconscious episode of jaw clenching and teeth grinding when a person is asleep. When it has become severe, the person with bruxism may suffer from a damaged tooth or injured gum. The impact of bruxism may not be lethal, but it will reduce your sleep quality, your confidence, and also causes unnecessary medical bills. Here, we are digging deeper into this condition and how to treat it. You may think that people who have severe anxiety issue are the ones who are more likely to grind their teeth during sleep. According to the Sleep Foundation, there is no clear link between a person’s psychological condition with Bruxism episodes. The most robust relation is found in subjects who consume amphetamines. 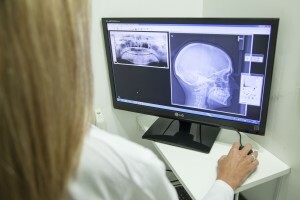 Bruxism seems to involve biochemistry imbalance or disruption in our body. Also, a study published on NCBI (the National Center for Biotechnology Information) concluded that bruxism might occur to anyone regardless of their age. Eight percent of the adult population experience teeth-grinding. Kids who have the condition are also more likely to have other psychological disorders like sleeptalking, drooling, sleepwalking, and sleep apnea. Bruxism seems to be in a correlation with other sleep disorders. The quick solution to jaw-clenching episodes is to use a dental guard. It is a mouth device that is worn to protect your teeth and gum. There two types of dental guards: universal and custom fit. 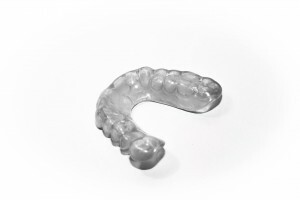 The universal fit dental guard is cheaper and more straightforward to wear compared to the custom fit. The custom fit requires you to come to the manufacturer and to make a dental guard with a mold of your dental structure. Its advantage is obvious. You will feel the device fit your mouth without any discomforts. However, it takes time to process. People with a history of bruxism are more likely to get the episodes if they meet the triggers. First, although the link of bruxism with psychological conditions has not yet been established by science, you can start improving your health by living a healthy lifestyle. Caffeine, nicotine, and sleep pills can be addictive and damaging to the body. You should try to be more active by allocating some of your time to jog, swim, walk, or ride a bicycle. Second, you should change your diet to be healthier. Avoid junk food, cut your alcohol intake, and cook the meal by yourself. Foods from restaurants may contain too much unhealthy seasoning and may be made of spoiled ingredients.